Grzegorz Kowalski has four Grand Prix Top 8 on his resume, together with a finals finish at the 2017 World Magic Cup as the captain of the Polish National Team. His best finish at the Pro Tour level was tenth place at Pro Tour Shadows over Innistrad. He also had 141 lifetime Pro Points before this weekend, making him the most prolific Polish player of all time. With so much high-level gaming experience, it was unsurprising to see Kowalski show up with an innovative deck for the highly anticipated Modern Pro Tour. Kowalski's list was unlike any other in the field. Indeed, most of the players running Thought-Knot Seers and Reality Smashers had them in Eldrazi Tron shells which were predominantly colorless. Grzegorz Kowalski's version was Red-Green and did not utilize the Tron set. Instead, he relied on Karplusan Forest and Grove of the Burnwillows to support these Eldrazi, as well as color-support cards such as Lightning Bolt, Noble Hierarch, Scavenging Ooze, and Ancient Stirrings. Oh, I forgot about the most important card, Eldrazi Obligator. 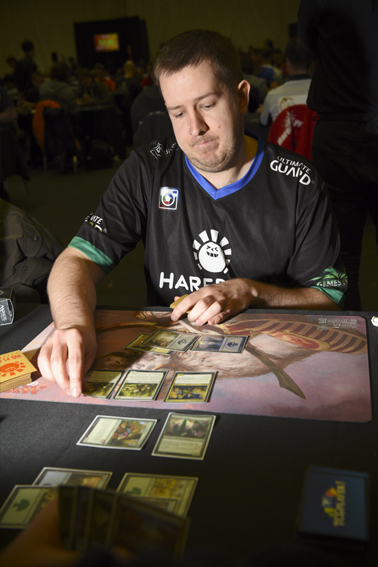 "I tested with team ChannelFireball and team Ultra PRO, along with a couple of friends," he explained. "Ben Weitz was the first guy to find the deck, but at that time he didn't think the deck was real. He brought it to Magic Online and went 5-0 in a competitive league. Then, the decklist showed up on the Magic Online website, MTGGoldFish, and then Efro also wrote an article about it." Despite the "media coverage," Kowalski maintained that his deck choice was extremely under the radar, which was why he decided to bring this weapon of choice when everyone else abandoned ship. "Many players on our playtesting team liked the deck for a long period, and we spent a lot of time developing and fine-tuning it. However, as everyone understood the deck more, and knew how to play against it, we discovered that our win-rate dropped noticeably. Because of that, a lot of my teammates, who had originally decided to play the same deck as me, switched decks a couple of days before." The deck has a lot of unexpected tricks which can take an opponent aback, and Kowalski had won numerous games by surprise. For example, instead of only Dismember, Kowalski had a playset of Lightning Bolt, along with a single Forked Bolt, supplementing his aggro deck with cheap interaction spells. He said that Ancient Stirrings is "basically a Demonic Tutor" and he had nothing but praise for both Scavenging Ooze and Eldrazi Obligator. Grzegorz Kowalski, in his pursuit of enough Pro Points for Gold this season, brought an interesting Eldrazi concoction to the tournament. Scavenging Ooze was not among the most played cards in the format as found in the Day One Metagame Breakdown, as it did not make the Top 64. This data corresponded to Kowalski's hunch that Scavenging Ooze was underappreciated at the moment. "I feel that the card is well-positioned right now, I think more people should be playing it. It's great against Death's Shadow, Tarmogoyf, and there are so many other strategies it is effective against." Kowalski rattled off a list of decks which use the graveyard, such as U/R Gifts Storm, Mardu Pyromancer, Snapcaster Mage decks, Dredge, Living End, and so on. "Scavenging Ooze is also very powerful against Burn, as well as Eldrazi mirrors. You can grow it to a 6/6 and block Reality Smasher!" "Eldrazi Obligator is fabulous against most decks with creatures, even if they're not creature-based," he continued. "Against a control deck, I can cast Noble Hierarch on turn one and Eldrazi Obligator on turn two to attack for 4 damage. That is quite a fast clock. Even against combo decks like Titan Shift, stealing Primeval Titan with Obligator means 9 damage minimum. Since I will likely be attacking in the early game, that should be enough to finish my opponent off before he wins next turn. Oh yes, and Eldrazi Obligator also kills Death's Shadow." All these considerations provided Kowalski affirmation that he was making the correct choice, but that's not all. With Death's Shadow deemed a prevalent threat in Modern, that shaped his decision to revamp his entire mana base. "I'm not playing Tron lands because I want to play Grove of the Burnwillows. I've killed many Death's Shadows by simply giving my opponents extra life." Kowalski did not feel too hot about his 3-3 Booster Draft record, but he was optimistic about the Modern rounds. Going 4-1 yesterday, he hoped to do well enough to hit Gold this weekend. "I had 22 Pro Points before yesterday, and Gold level is my target for this season," he said. "I will be traveling to many Grand Prix this year, and I intend to play more than I did before. In addition to Europe and US Grand Prix, I was even considering going as far as Grand Prix Singapore in June." Well, that's nice. I'm from Singapore. Do you need a Goblin "Guide" perhaps? I offered to help him with travel arrangements such as air tickets and hotels. Regardless of whether the plans materialized, I'm glad that I got a chance to get to know Kowalski better. We expect to see more of the talented Polish player around as he continues his relentless pursuit of excellence.